1995 Topps Baseball is a 660-card set split between two series. Series 1 has 396 cards while Series 2 has 264 cards. Card fronts have a bright white border. Player images have a rough edge. The player's name is written with a non-traditional font in gold foil at the bottom of the card. The player's position and team are under the name in block letters. 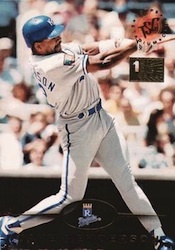 Already standing out with a different design, many of the photos used in 1995 Topps Baseball further separate it from other flagship sets released before and after. While posed portraits are nothing new, many of them take a more dramatic and playful approach. 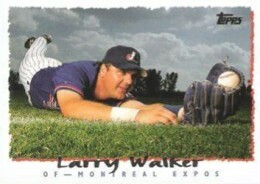 A common theme of many of the portrait cards is that they're shot from below, making the player seem larger-than-life. Intentional or not, many cards also sky shots to further add to the cards' style and feel. Multiple-exposure shots also appear on a handful of cards, showing the full motion of a play. 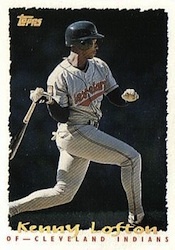 1995 Topps Baseball does not have any significant rookie cards. The biggest is Rey Ordonez. Babe Ruth has a commemorative card honoring his 100th birthday. Cyberstats is a 396-card partial parallel that predicts final stats for the 1994 season had it played out to completion. Card fronts are done with foil. The backs have a black design. Cyberstats are inserted one per hobby and retail pack, and three per jumbo pack. 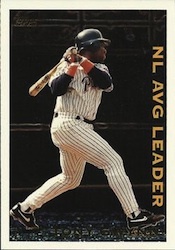 1995 Topps Baseball factory sets have seven exclusive Cyberstat Season in Review cards that predict specific events and postseason highlights that might have happened had the strike not happened. 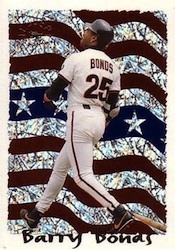 One card of note is a Barry Bonds "61 Home Runs" card. 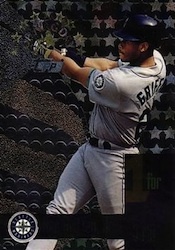 Total Bases Finest are exclusive to 1995 Topps Series 2. Inserted one per box, each card is printed similar to Finest cards with a chromium-like finish. They also have a plastic protector that can be peeled off. 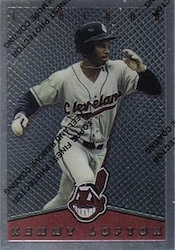 1995 Stadium Club First Day Issue cards are also included in Series 2 packs and factory sets. These are parallels to the 1995 Stadium Club Series 1 set, a separate release. 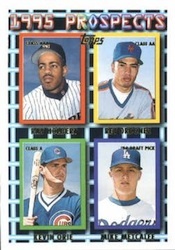 Nine "preview" cards are also included in 1995 Topps Series 1 packs. These nine cards are the same as the ones found in 1995 Topps Series 2 packs. 1995 Topps Cyber Stat Lot (250) All Different All Sleeved HOF RC AWESOME!!!! 1995 TOPPS SERIES 1 HOBBY BASEBALL BOX FACTORY SEALED 36 PACKS.